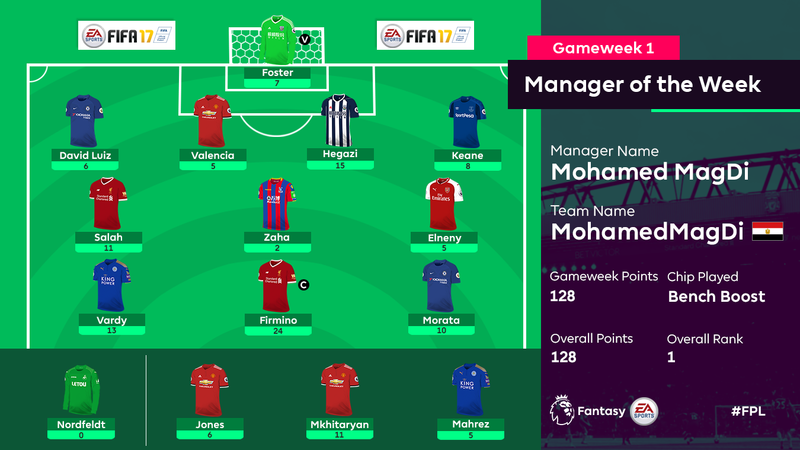 Mohamed Magdi has his compatriots to thank for an incredible 128-point Fantasy Premier League Gameweek. Mohamed Elneny (£4.5m), Mohamed Salah (£9.1m) and Ahmed Hegazi (£4.6m) all helped the Egyptian storm to the top of the rankings and claim the first Manager of the Week prize. Elneny kicked things off with an assist in Arsenal’s 4-3 victory over Leicester City on Friday, before the two new signings announced themselves with major Gameweek 1 hauls. Salah produced a goal and an assist in Liverpool's 3-3 draw with Watford on his return to the Premier League. Hegazi recorded 15 points thanks to a goal and clean sheet in West Bromwich Albion's 1-0 victory over AFC Bournemouth. Like so many Manager of the Week winners, Mohamed put his Bench Boost chip into play to gain an early advantage. His substitutes scored 22, with Henrikh Mkhitaryan (£8.0m) contributing half that total thanks to two assists and two bonus points in Manchester United's 4-0 victory over West Ham United. Roberto Firmino (£8.5m) was Mohamed’s captain and another key man. The Liverpool forward's penalty and assist for Salah’s goal at Vicarage Road contributed 24 points for Mohamed, who sits on top of the world (ahead of almost 4.3m managers) in his debut FPL season and in contention for the August Manager of the Month accolade. Mohamed wins a copy of FIFA 18, a Nike Ordem V match ball and an FPL mug, all bagged up in an FPL rucksack.